Seribu Islands Water Resources (SDA) Sub-dept. constructs Wastewater Treatment Installation (IPAL) in Lancang Island. This project is targeted to finish in December 2018.
" 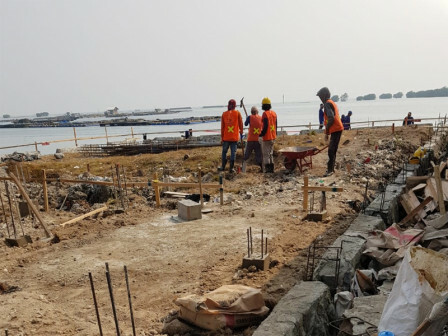 IPAL will be connected to 600 houses in Lancang Island"
"We have started this construction in August. Our target is to complete it on December 15," informed Ahmad Saiful, Seribu Islands SDA Sub-dept., Friday (9/14). IPAL will be constructed in two zoning areas. Zone 1 is made for 250 houses and zone 2 for 350 houses. "IPAL will be connected to 600 houses in Lancang Island. Its budget i s Rp 9.9 billion," he stated.